Being young doesn't protect you. Horrors come for kids, too. After Lucretia's (or Loochie's) mom tries to throw her a birthday party (to disastrous results), all she wants is for her friend Sunny to come home from hospital, where she is undergoing cancer treatment. On the big day of Sunny's return, Loochie's brother comes to their apartment and tells Loochie about the Kroons, a family of druggies who lived 2 floors above them in their apartment building. According to her brother, the landlord boarded the Kroons into their apartment to let them fend for themselves, as they had become far too dangerous to deal with, and nobody had seen them in quite some time. Loochie isn't sure if her brother is telling the truth or if he's just trying to scare her, but either way he tells her to be careful, as terrible things can still happen to her even though she is young. When Sunny is kidnapped by none other than the Kroons, Loochie takes it upon herself to rescue her best friend. What follows is hard to describe. It is equal parts horror, magical realism, and coming of age. Loochie finds herself in a world gone wrong, yet one that is strangely familiar. Loochie eventually finds Sunny and saves her, but at what cost to either girl, or the one Kroon sister that has come to their aid? 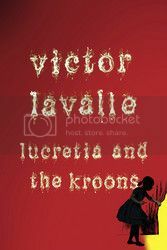 Based on the description of The Devil in Silver, the events of Lucretia and the Kroons is the explanation as to how Loochie ends up in the situation she finds herself in. I know this all sounds really vague, but it needs to be. The story is too easy to spoil and really too hard to explain it without sounding crazy. I felt like I was reading a lost Twilight Zone screenplay. I could imagine what the world Loochie finds herself in easily, and could easily picture what this would look like as a television program or even on the big screen. Everything about this story is just like our world, just a little off. I thoroughly enjoyed ever bit of it, even though it is fairly short, and will definitely be checking out The Devil in Silver in the near future.